Got your party shades on, Miami? Good, because we’ve got a solid reason to celebrate! Accompanied by a proclamation from the mayor (seriously), May 23rd is officially Miami Sunglass Hut Day. For the occasion, our favorite bearer of shades, Sunglass Hut, is returning to its hometown and opening its largest (and most tech-savvy) retail store in the country, but not without a major shindig. 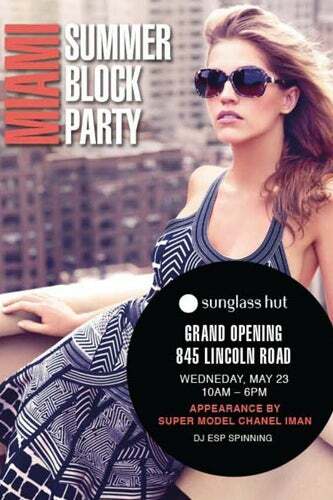 At 10 a.m. this Wednesday, May 23, Sunglass Hut will open its doors to the public, offering guests a chance to explore the 1,875-square-foot shop and try on over 2,000 pairs of sunnies, all in the largest Sunglass Hut space to date. Enjoy giveaways, fun promotions, and the chance to meet supermodel Chanel Iman as she talks her favorite shady trends. Lucky event goers can even win a chance to rub elbows with celebs and enjoy some street games and cocktails at Sunglass Hut’s private VIP block party later that evening, where web sensation Karmin will be performing live. Wanna go? Well, we have a pair of tickets to the soiree for one sunglasses-savvy fan, so comment below and we'll pick a winner at random. Go on and whip out those round-rimmed shades you’ve been dying to wear. This is one party where it’s perfectly fine to wear your sunglasses at night. When: Wednesday, May 23, 10 a.m. to 6 p.m.
Where: Sunglass Hut; 845 Lincoln Road; 305-674-6906.